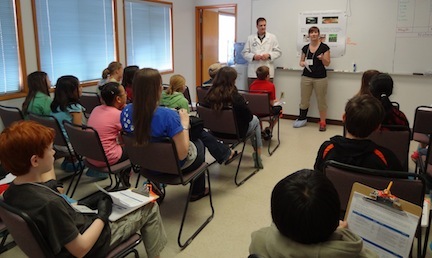 A field trip for 28 local 5th graders from Hoover Elementary School was held at the Sinnhuber Aquatic Research Laboratory (SARL) on May 12, 2014. SARL, directed by Dr. Robert Tanguay, is a large state- of- the -art zebrafish facility used greatly for OSU SRP Project 3 – Systems Approach to Define Toxicity of Complex PAH Mixtures. Robert Tanguay and Carrie Barton present about zebrafish research to 5th graders. The SARL personnel, along with SRP Trainees and other grad students and postdocs, wanted the students to get hands-on experience and enjoy science. 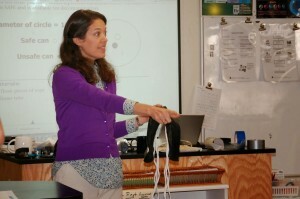 Specifically the students learned all the unique features of zebrafish and how they are used in scientific research. In 2012, curriculum was developed for visiting classes. Students break up into five groups and rotate through various stations. 1) Tour of the Land of Zebrafish / Zebrafish Life Stage: Learn about how small the fish are and how rapid they develop. 2) Glow in the Dark Zebrafish: Learn about the different tools used in research. 3) The Good, The Bad, and The Ugly: Sort out dead and alive embryo, and determine the age of zebrafish. 4) Toxicity Screening: Learn how to get embryos into wells, view plates under the microscope, and identify normal and not normal fish. 5) Fish Are Like Us: Identify similarities between fish and humans. Posted in Events, Science Education, Training. 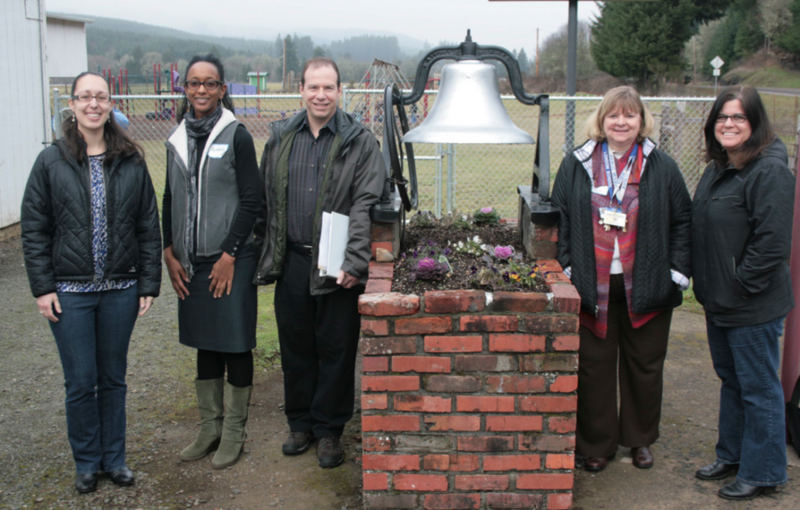 This year the EPA Partners in Technical Assistance Program (PTAP) Pilot has launched the first project with a school located near the Black Butte Mine Superfund Site in rural Cottage Grove, Oregon. OSU Superfund Research Program has begun a partnership with EPA through this Pilot to help them expand upon their community outreach capabilities surrounding the Black Butte site. On December 18, 2013, we met with Laurie Briggs, the Principal of the London School, because she had a strong desire to give her students and their families’ science and environmental health knowledge. About 100 rural K – 8th grade students go to London school. Our visit included getting to know one another, listening to the needs of the school, and a school tour. We were impressed with the beauty and organization. The school built and maintains a 1/4-acre organic garden, and has a trail to a river flowing behind the property. 72% of the students qualify for free/reduced lunch, and delicious healthy meals are cooked on site. 2) Address community and educational needs. 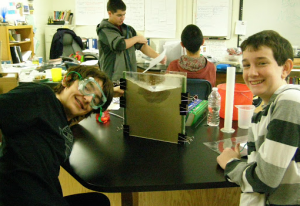 Create a hands-on, project-based integrated curriculum related to the science of the Superfund site and mercury contamination that can serve as a model for other rural, small schools. Discuss ways to educate the students and community and expand and build a sustainable partnership. 3) Provide training opportunities for SRP Trainees wanting outreach experience. 4) Help students understand career opportunities in environmental and life sciences. Posted in Community Engagement, Research Translation, Science Communication, Science Education, Training. Lisa Troy, an 8th grade science teacher at The Sage School in Foxboro, Massachusetts chose the NIEHS-funded Hydroville Curriculum as a way to give her students a real-world problem to solve, teach them collaboration and teamwork skills, and expand their understanding of “doing” science. She was also very interested in environmental issues and once worked as an environmental consultant on EPA’s Superfund/RCRA Hotline. In the Hydroville Pesticide Scenario, students work in teams to examine and clean-up a large accidental spill of metam sodium near a river. In this scenario students take on roles of an environmental chemist, environmental toxicologist, soil scientist, and mechanical engineer. It creates a valuable experience to learn about these careers and how they work together to solve problems. The students were learning about toxicity, LD50, and NOEL (No Observable Effect Level) through a seed germination lab. Lisa Troy had read about Dr. Tanguay in the recent YALEe360 article, and she shared his research with the students. The students were very excited to speak to a “real” scientist who is engaged in meaningful work and making a difference. 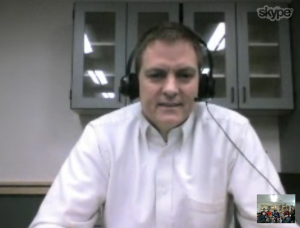 A highlight for the students was when they Skyped with Dr. Robert Tanguay. 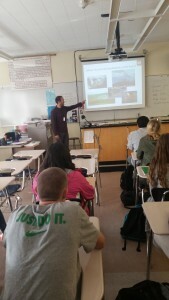 Students were especially interested to learn how zebrafish are being used as models of human response to chemicals in research all over the world. They shared a long list of questions with Dr. Tanguay in preparation for the Skype event. The students were intrigued by the idea that, through research such as Dr. Tanguay’s, chemical manufacturers will know much more about the effects of individual chemicals and the possible synergistic effects of mixing chemicals. They were reassured to learn of the human treatment of the fish, as well. 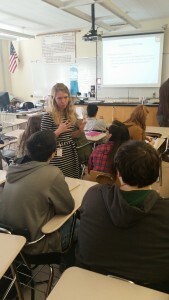 To increase career connections, Lisa Troy asked the parents, teachers, and administrators to identify any skills that were important to them in their work or life experience from a list she generated of all the skills the students learned or used during the course of Hydroville. They checked nearly all of the skills! Posted in Research Translation, Science Communication, Science Education. How Do We Measure Trace Amounts of Chemicals in the Air? A very powerful and sensitive instrument used to study trace amounts of chemicals is a gas chromatograph connected to a mass spectrometer, or GCMS. GCMS is especially useful for air samples, but it is also used to detect, quantify, and identify chemicals in water, soil, plant and animal tissue, and many other substances. The GCMS can detect chemicals in amounts as small as a picogram. That is 0.000000000001 gram. One picogram is the equivalent of one drop of detergent in enough dishwater to fill a trainload of railroad tank cars ten miles long. Many of the pollutants found in air are present at concentrations lower than one picogram in a cubic meter of air. It is important for an the instrument to be able to detect these low concentrations. The GCMS instrument is made up of two parts. The mass spectrometer (MS) identifies and quantifies the chemicals. The GC separates chemicals based on their volatility, or ease with which they evaporate into a gas. It is similar to a running race where a group of people begin at the starting line, but as the race proceeds, the runners separate based on their speed. The chemicals in the mixture separate based on their volatility. In general, small molecules travel more quickly than larger molecules. The MS is used to identify chemicals based on their structure. Let’s say after completing a puzzle, you accidentally drop it on the floor. Some parts of the puzzle remain attached together and some individual pieces break off completely. By looking at these various pieces, you are still able to get an idea of what the original puzzle looked like. This is very similar to the way that the mass spectrometer works. Injection port – One microliter (1 µl, or 0.000001 L) of solvent containing the mixture of molecules is injected into the GC and the sample is carried by inert (non-reactive) gas through the instrument, usually helium. The inject port is heated to 300° C to cause the chemicals to become gases. Oven – The outer part of the GC is a very specialized oven. The column is heated to move the molecules through the column. Typical oven temperatures range from 40° C to 320° C.
Column – Inside the oven is the column which is a 30 meter thin tube with a special polymer coating on the inside. Chemical mixtures are separated based on their votality and are carried through the column by helium. Chemicals with high volatility travel through the column more quickly than chemicals with low volatility. Ion Source – After passing through the GC, the chemical pulses continue to the MS. The molecules are blasted with electrons, which cause them to break into pieces and turn into positively charged particles called ions. This is important because the particles must be charged to pass through the filter. Filter – As the ions continue through the MS, they travel through an electromagnetic field that filters the ions based on mass. The scientist using the instrument chooses what range of masses should be allowed through the filter. The filter continuously scans through the range of masses as the stream of ions come from the ion source. Detector – A detector counts the number of ions with a specific mass. This information is sent to a computer and a mass spectrum is created. The mass spectrum is a graph of the number of ions with different masses that traveled through the filter. The data from the mass spectrometer is sent to a computer and plotted on a graph called a mass spectrum. The Unsolved Mysteries of Human Health web site was developed by the Environmental Health Sciences Center, another NIEHS-funded Center at OSU. The GCMS section of the web site was developed in collaboration with Dr. Staci Simonich, Superfund Center Project 5 leader. The interactive image above received about 37,000 pageviews this past year (up about 10,000 from the previous year). It is the most popular page coming out of our Centers. Unfortunately, the interactive image does not currently work on an iPhone or iPad. Posted in Science Communication, Science Education.